If you’re heading out to Port Canaveral, there’s some great news. Despite being one of the busiest cruise ports in the world — serving roughly 4 million passengers each year — the port is a breeze to navigate. Still, if you’re unfamiliar with the area getting to your ship can be a little confusing. That’s why we’ve put together this guide to help get you where you’re going. Starting out, it helps to have an overview of the port before you get there. The port is located about 45 minutes due east of Orlando, on Cape Canaveral. Don’t worry about not being able to find it. There is only one road from Orlando to Cape Canaveral — Florida 528 (a toll road also know as the “Beachline”). Assuming you are coming from Orlando, once you reach Cape Canaveral (after going over two causeways), you will see a roadsign giving you two options. You can either stay on the Beachline to head toward the “B” cruise terminals or you can exit to your right to go to the “A” cruise terminals. The “A” terminal is where the large cruise ships — Disney, Royal Caribbean, and Carnival — make their home. You will take this exit to your right and make a large loop around. Once you make the loop, you will see the cruise ships almost directly ahead of you. Continue down this road and you will head straight until you are almost past all the cruise terminals. Eventually you will see a large blue sign listing all the cruise lines with an arrow that tells you to veer to the right. Just past that, you will see a single lane exiting to the right. This exit will lead you to the cruise terminals. To know where to go next, you need an overview of the cruise terminals at Port Canaveral. While the port is large, each of the major cruise line has its own dedicated terminals. Carnival uses terminals 5&6. Disney uses terminal 8. Royal Caribbean uses terminal 10. Once you exit, you will continue straight (there will be signs directing you) to head to the Carnival cruise terminals. As you continue straight, you will pass directly in front of the terminals, giving you a chance to drop off passengers or luggage. On your left you will see the parking garage and parking lots. Things can get a little confusing, so we’ve included the map below to who you the path you can take to pass in front of the two terminals and then continue on to the parking lot. To get to Disney’s port (Terminal #8), you will take a right after exiting from the main road into the port. Once you exit, you will loop around to your right, before heading back south — the direction from which you originally came into the port. As you head south, you will want to look for the left lane, which will be marked on the asphalt with a large arrow that says “Disney” underneath. Eventually this lane will turn to the left, and head to the terminal. Once you turn, we suggest staying in the left two lanes. This will take you through a point where you can drop off passengers or luggage. From there, you will see the parking area on your left. The entrance is on the left, just past the parking garage. If you are sailing Royal Caribbean, you will take a right after exiting from the main road into the port. Once you exit, you will loop around to your right, before heading back south — the direction from which you originally came into the port. From here you will pass the Disney terminal on your left. Keep going. Eventually the road loops around toward the ship and the Royal Caribbean terminal. Parking is on your right so you will want to be in the rightmost lane, exiting just before you reach the parking garage and surface lot. One thing to keep in mind no matter where you cruise from — help is just a question away. Cruise days are busy, and the port understands that many people aren’t sure exactly where they should go. Don’t hesitate to ask. Getting to Port Canaveral — Transportation options from airports and the Port Canaveral area to the cruise port. Everything you need to know to get to the port and start your vacation. Port Canaveral Cruise Parking — Parking at the port? We’ve got you covered with all your parking options, including costs and discounts. 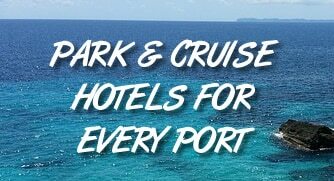 Port Canaveral Park and Cruise Hotels — If you plan to stay in the area the night before your cruise, look at this list of hotels that offer cruise parking with a one-night stay.